Lock and load, Brisbane Southsiders—there may finally be a reason for people to come over to your side of the river. (I can just feel all the angry Southsiders blowing up at me as they read this.) 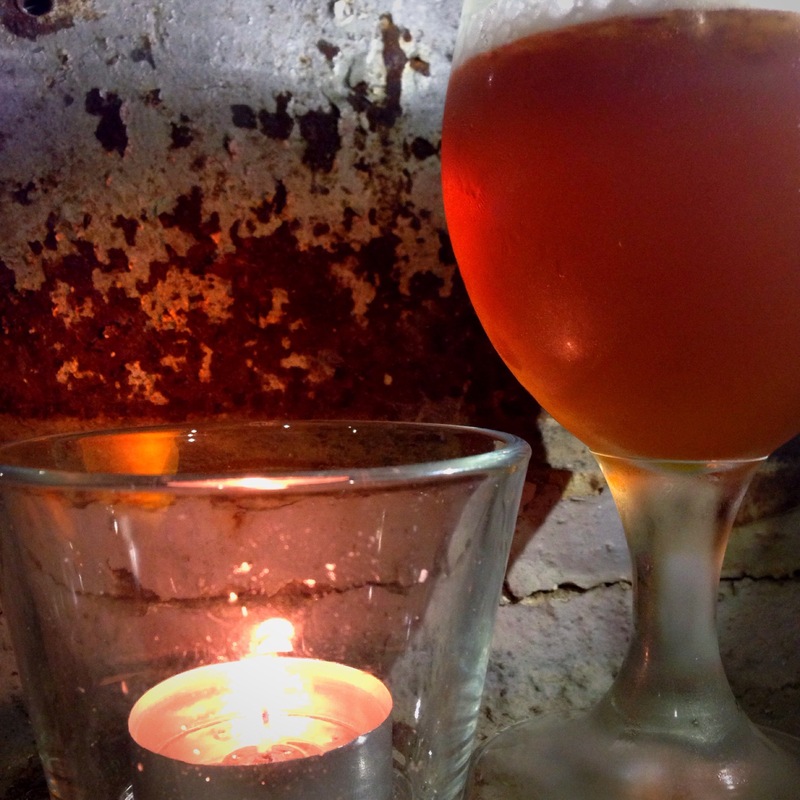 You’ve been gunning for a solid craft beer brewery on your side of town for a while. Until now, you’ve had to shoot over to West End for Catchment and Brisbane Brewing, or across to Newstead and Green Beacon. Or of course, you could head out to Bacchus, with their amazing barrel program. If you’re really keen, you could always go long range and hit up Beard & Brau or Fortitude. But the fact is, you’ve missed having a craft beer brewery to call your own. 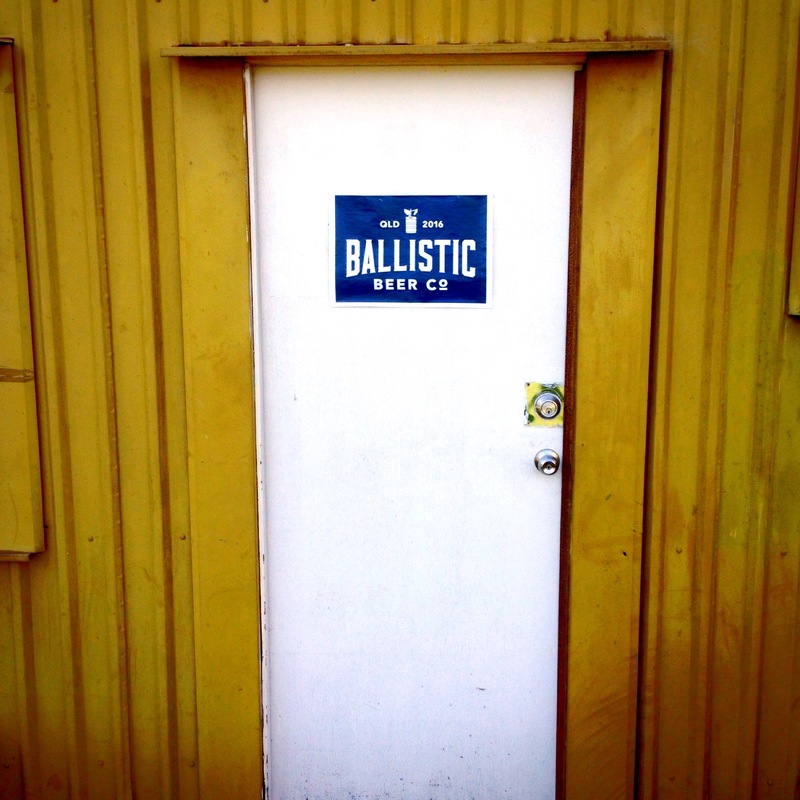 Well, as of next year, you’ll have a real brick-and-mortar brewery in Salisbury—Ballistic Beer Co.
I’ve had them in my crosshairs for a while—I’ve been scoping them out on social media, as I do. And when I saw on their blog that they were aiming to open up in the coming months, it triggered something in me, and I went for a visit. Now, I’ll admit: Salisbury isn’t often a target destination for me. Northsiders generally assume the South Side is just a wasteland of rubble, so when I found the industrial area that Ballistic calls home, I wasn’t surprised. I knocked on the door of what appeared to be an empty shell of a warehouse, and was met by something that gave hope to my semi-craft-beer-hipster heart—combed hair, a flowing beard, and a beer t-shirt. Lachy Crothers, Head Brewer and Beer Grower of Ballistic Beer Co.
Lachy’s the head brewer of Ballistic. But of course, as the only full-time employee of a start-up company who spends much of his time alone inside a giant warehouse, he’s a jack-of-all-trades at the moment—he does most of Ballistic’s administration, planning, gardening, cleaning, blogging, and if he’s anything like me, he probably shoots around the warehouse on a swivel chair sometimes. On this particular day, however, he left the swivel chair in the office, and gave me a tour of the brewery space on foot. 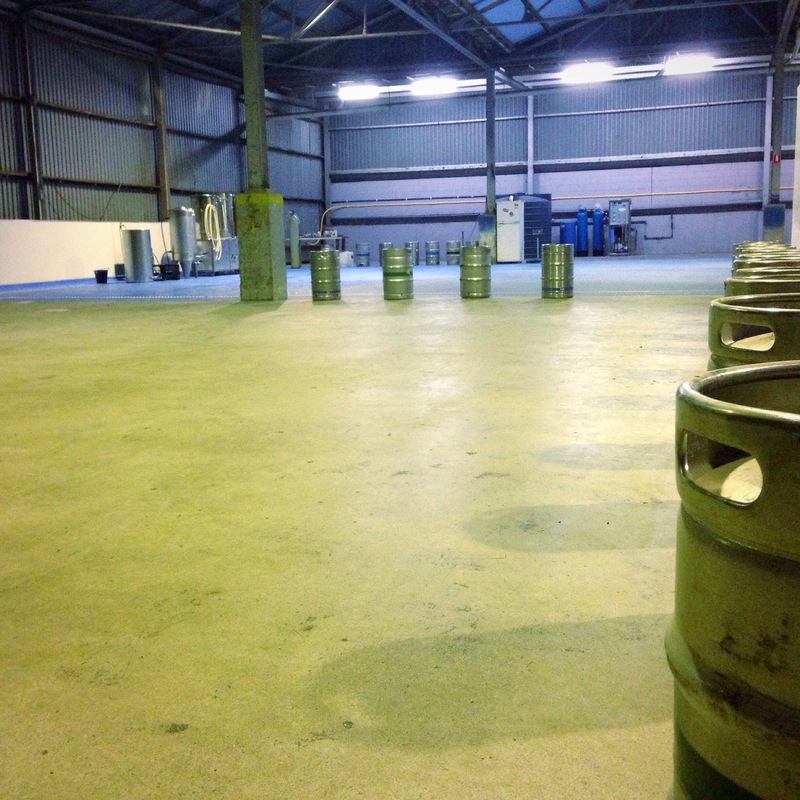 I say ‘brewery space’, because the place is still in its infancy. 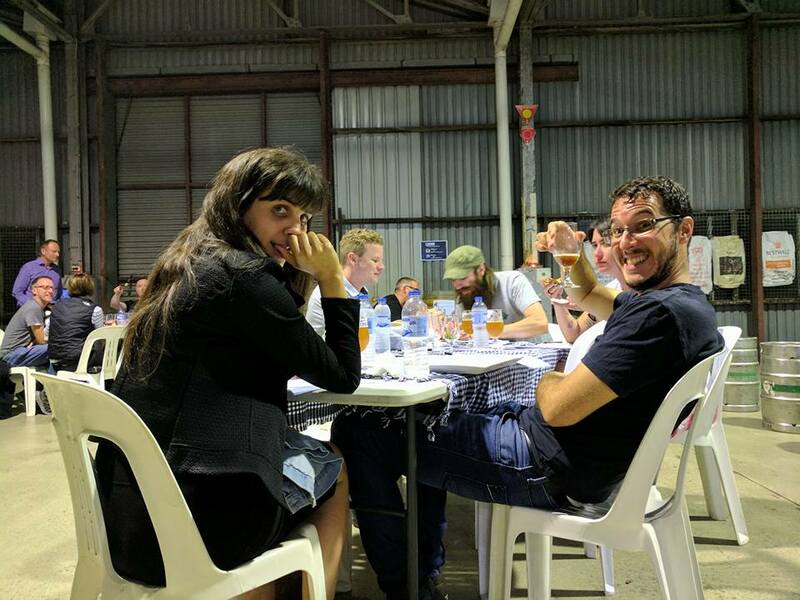 The cellar door area, with core range and seasonal beers on 8-12 taps, where they’ll be selling their beer and merchandise… is an empty 100m2 area, with the boundary marked out with kegs, and the ’bar’ marked out with bags of malt. 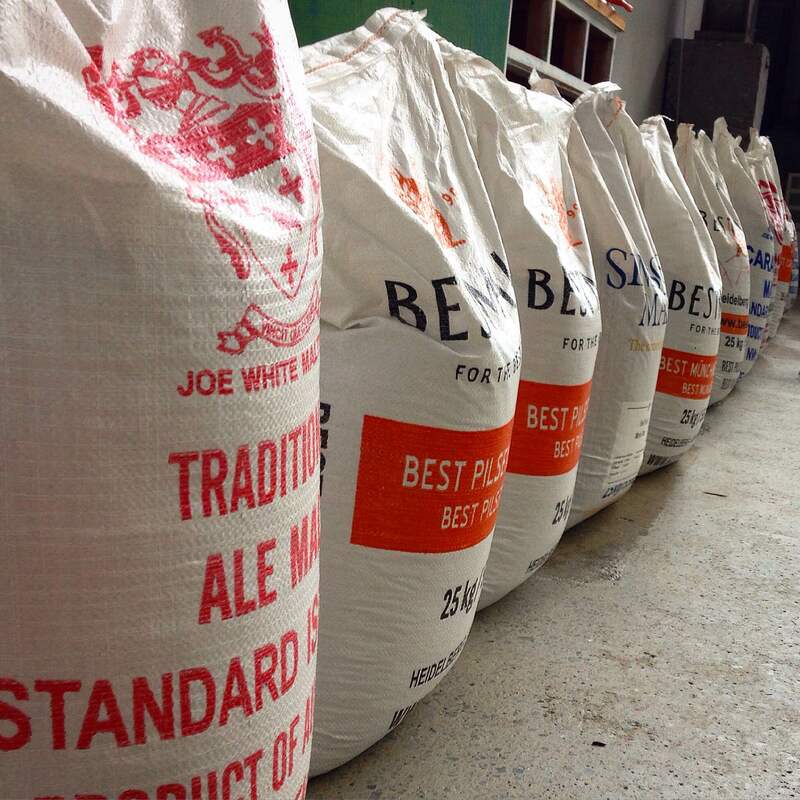 Bags of malt marking where the bar will go in the cellar door. The canning area, where a mobile canning line will wrap Ballistic’s precious beer in aluminium for takeaway brews until a permanent canning line is commissioned… is currently just an expanse of concrete and steel girders. An empty corner of the warehouse. Not that cool yet. But the next part of the tour I found very cool. The coldroom… is a monster. It’s 11m x 7m. That’s 77m2. You could fit 30 Twister mats in there. (That’s right—I did the maths.) That is a potential 80 people playing Twister in the coldroom. (The official Twister website seems to think it’s a game for 2-3 players. I’ve always played it with 4. WAY more fun.) That is more very cold Twister than you’ve ever seen. Giant coldroom. No Twister mat in sight. 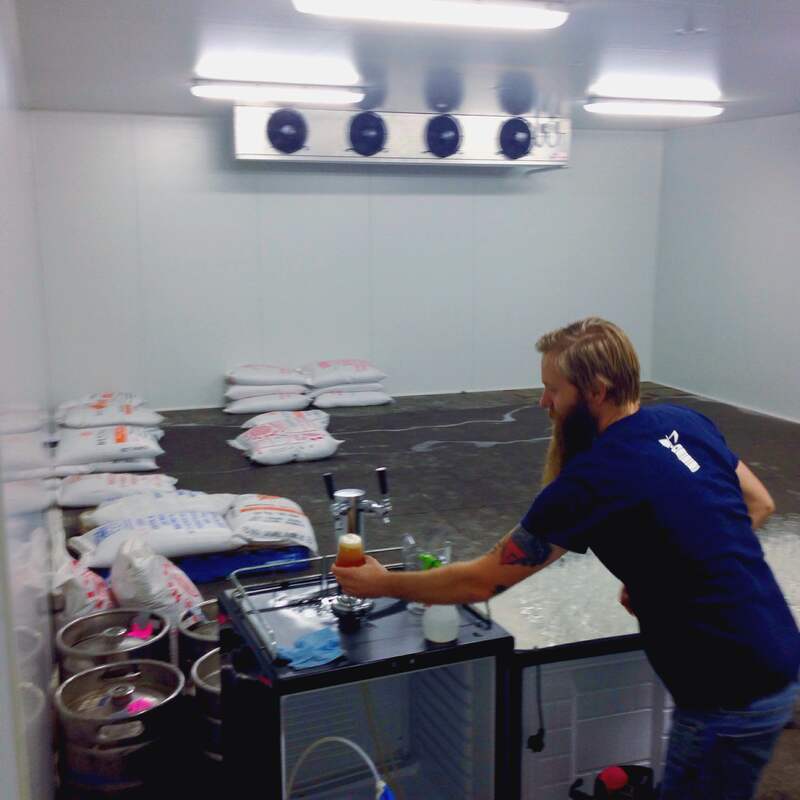 However, Lachy claims that instead of using the coldroom for maxi-freezi-Twister, they’re going to store their beer in it—it’s big enough to fit everything they can brew, which means all of their beer can be kept at the optimal temperature and remain at the optimal quality. That’s a privilege not all breweries can afford, so it’s nice that Ballistic will be able to pull it off in their giant warehouse space. After we’d wandered around the brewery for a while, we stood around with a fresh IPA (and when I say fresh, I mean fresh—as in an hour before I arrived!) to shoot the breeze. 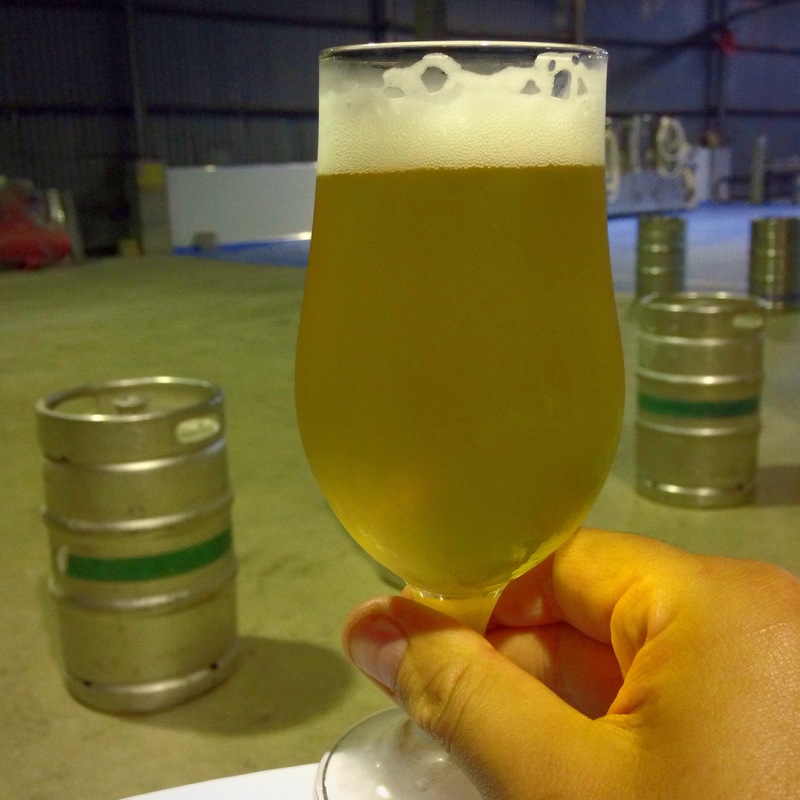 Lachy told me how he got his first job in brewing in 2010—he liked beer, so he searched on Seek.com for ‘beer’ and saw that Gage Roads was looking for an assistant brewer. He got the job, and while it initially involved a lot of drudge work, the high turnover of staff meant that by simply sticking around, he was trained up quickly. Within a year he was running a shift, and within 5 years, he was training team leaders, and ready to move on. 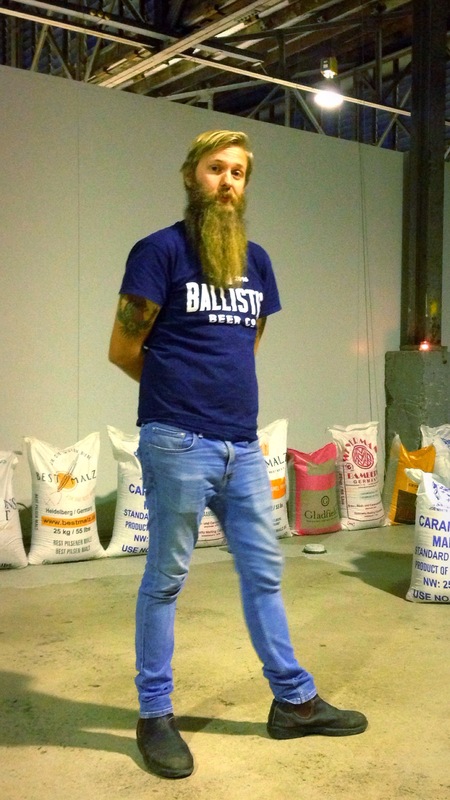 He travelled Europe with his fiancé, work for 6 months at Camden Town Brewery in London, and it was from there that he returned to Australia to take the job with Ballistic Beer Co. 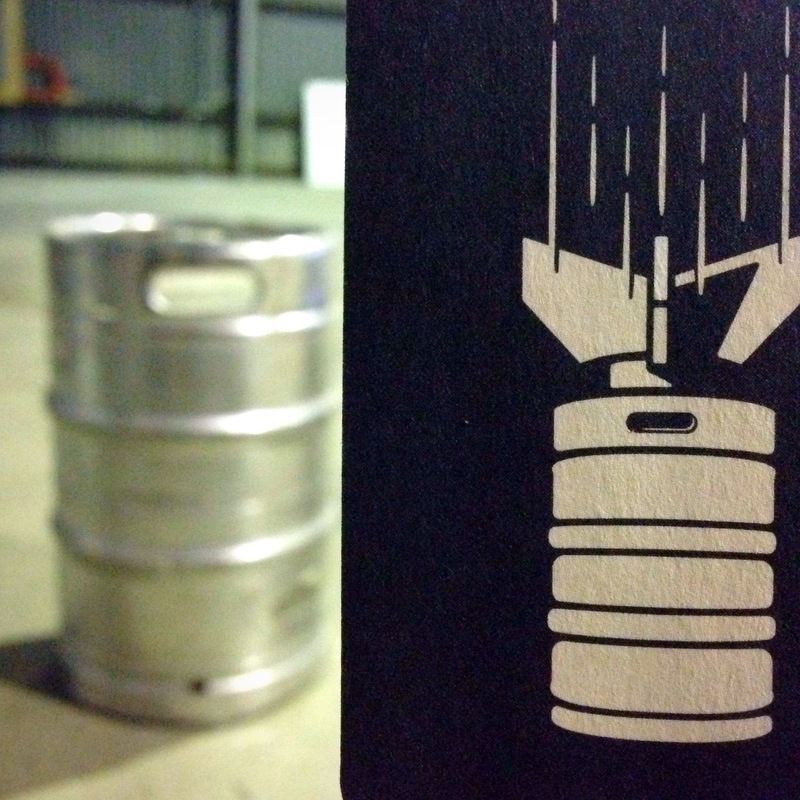 It was only after seeing the logo an embarrassingly large number of times before I realised the bomb is a keg. It was to taste the fruits of the Beer Poet’s labours that a number of industry people—bloggers, beerstagrammers, bartenders, etc—showed up to Ballistic a few days later for a VIP tasting evening. Of course, a number of us beerstagrammers and bloggers spent the first fifteen minutes wandering around like dogs exploring a new house, lining up the glasses of hops and malt that had been placed on each of the tables, and forcing our friends to help us take photos of kegs from funny angles. 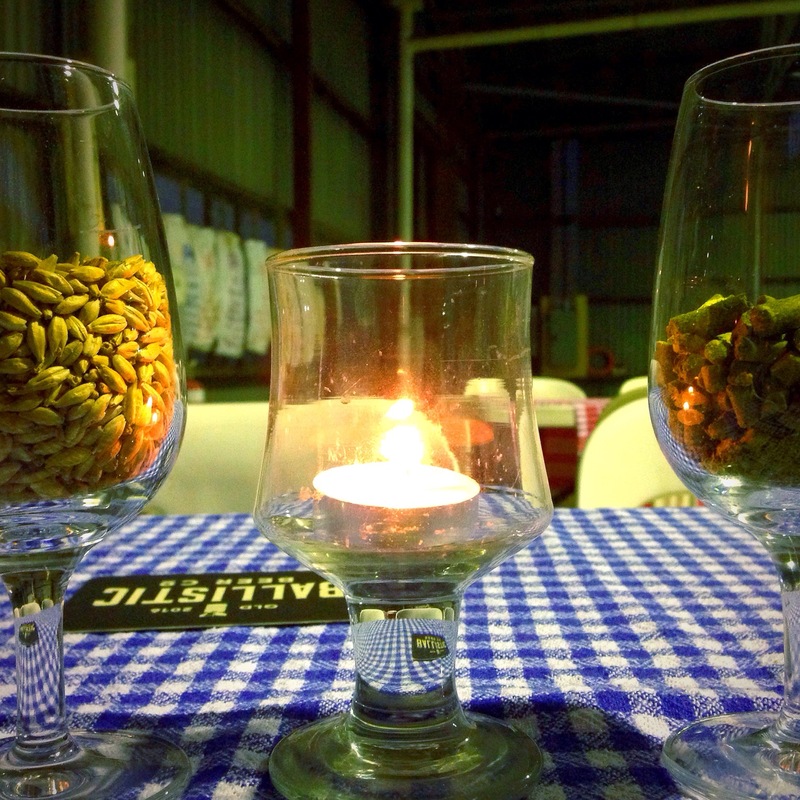 Malt, hops, and fire. Great combo. In time, we sat our restless selves down to listen to the spiels. It was here that we met David, the father of Ballistic. David owns and runs Brewers Choice (chain of homebrew stores), and brings a whole lot of business experience to the table. 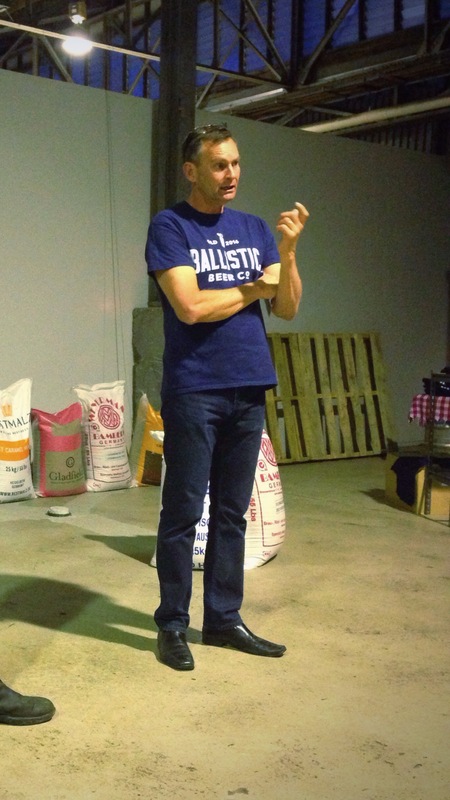 David Kitchen, Founder and Chief Beer Taster. 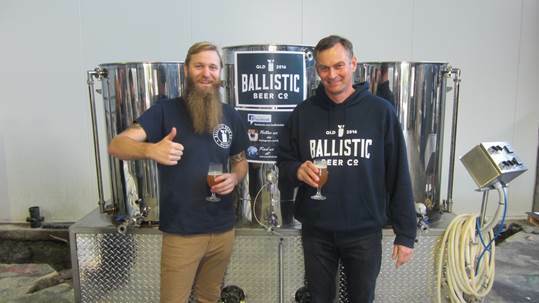 After living in Salisbury for over a decade, he decided that if he wanted a place to get great beer in his suburb, it was up to him to make it happen. So he found a warehouse in an industrial area that was used during World War II to develop armaments (the origin of Ballistic’s name), found Lachy, and got cracking on the behemoth. After David’s and Lachy’s patter, we went straight to the beers. They said, “Put whatever you want on the feedback form.” I put a beer on it. What they say: A Table Beer is a traditional European style that was low alcohol and intended to be shared and enjoyed with food. We took this idea and ran with it, creating a new world light beer that tastes like a full strength. Although lower in alcohol, this beer has the malt and body of a full strength and is balanced by pineapple and grapefruit aroma. What I say: Costa from La Sirène was the one who introduced me to the concept of a table beer. Belgian workers coming in from the field, ripping into their lunch and jugs of shared beer before they get back to their sweaty work. Very cool idea. Although I’m not generally one for lower alcohol beers (that is, anything under 7% ABV), I enjoyed Costa’s Belle French Ale more than I expected to, and I enjoyed Pilot Light more than I expected to as well. While I wouldn’t say it tasted like a full strength beer, it had more flavour than many mid-strength—a mouthful of breadiness and hops, and some decent aftertaste. Not a beer I’d drink on its own, but when I think about lying on the grass with a growler of this, a rustic loaf of bread, and some olives, my mouth begins to water. What they say: Lager has long been a dirty word in craft beer circles, but we’ve challenged that idea by creating a clean, crisp, contemporary craft lager to prove the lager haters wrong. An aroma of lemon sorbet and gooseberry with a delicate bitterness and dry finish. What they say: With a 100% Australian hop bill, this beer was unleashed to showcase the world class hops we grow here in Australia. A well-balanced but aggressively bitter fruit bowl of apricot, passionfruit, and pine. What I say: Now we’re getting to the good stuff! This was deep hazy orange, like looking through a dried apricot. 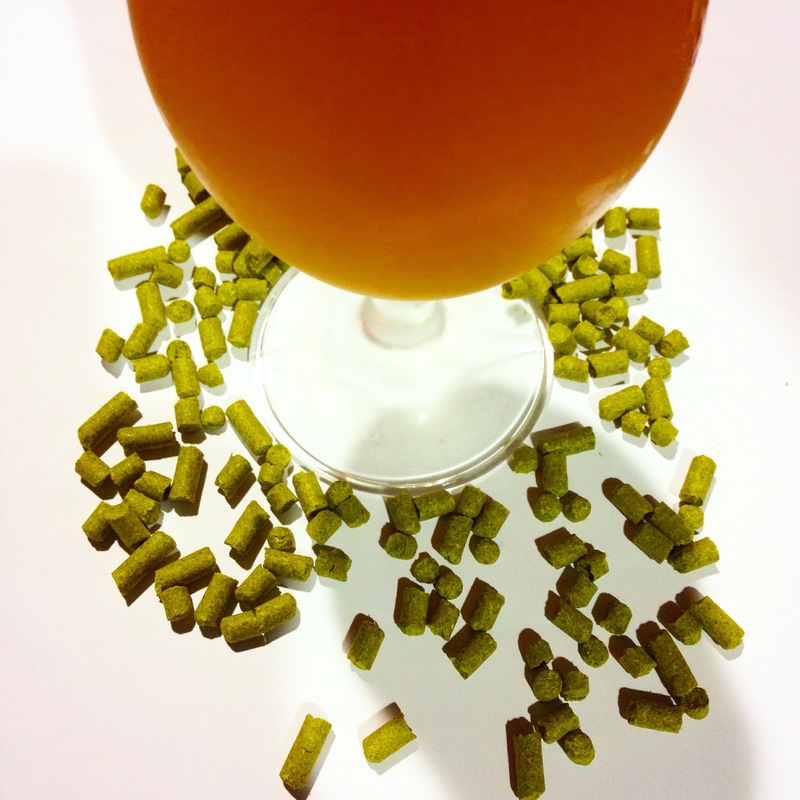 It’s packed full of Topaz, Summer, Victoria Secret, and Ella hops, and mighty tasty. I know it’s been described as ‘aggressively bitter’, but I found it quite easy drinking. 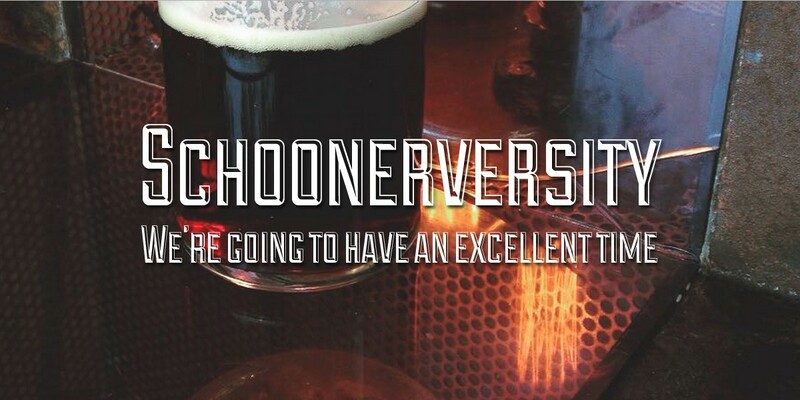 Some people think might say this is pushing into ‘heavy’ territory, but 6.5% ABV is juuuust starting to register on the Schoonervers-o-meter. 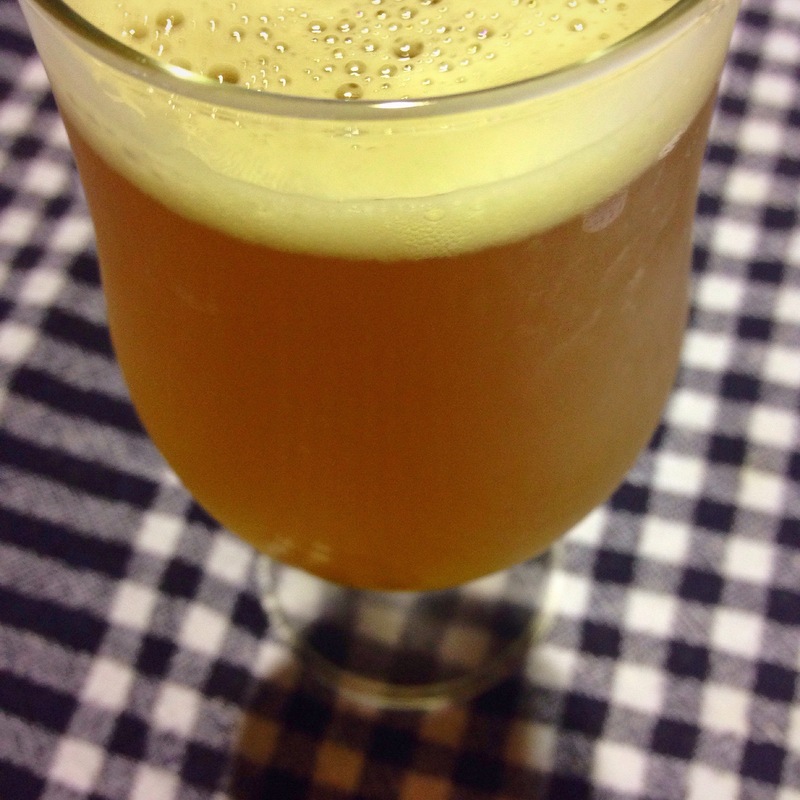 We began with the table beer… well, I’d call this a great table IPA. Best consumed from a jug. Hope to see some seasonal variations of this bad boy in the future! What they say: Inspired by our Head Brewer’s time brewing in the UK, this big English Style Old Ale uses 6 different malts and is aged on oak to enhance its rich complexity. Complex caramel, biscuit, and vanilla flavours are balanced by a warming alcohol and firm bitterness. What I say: There was a very limited amount of this one, so we only got a small glass of it, but it was so good. I expected it to be my favourite of the night, and it didn’t disappoint. It’s aged on American oak, but gazes into your eyes like deep mahogany. Other people said they picked up a lot of coconut, but not me. I got sticky date pudding with butterscotch sauce, and then a little bourbon as it warmed up. 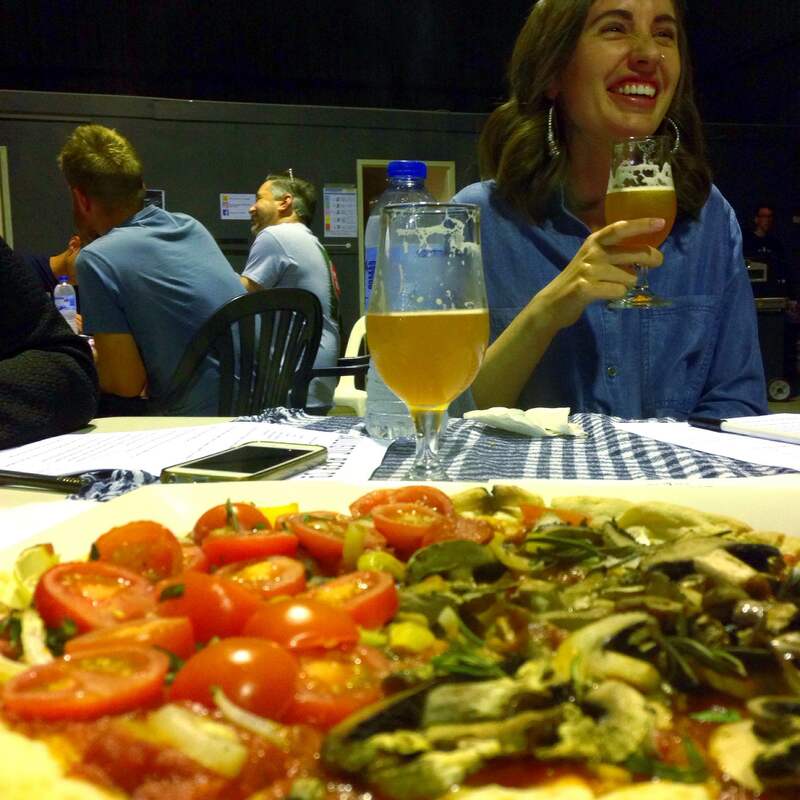 Once we’d tried the 4 beers, a million pizzas were cooked and served out like machine gun fire. Jugs of Australia Psycho were poured freely (I may have asked for a sneaky second glass of the old ale), and we chatted the rest of the evening away, as well as more happy snaps and exploring. ’Twas a good night. ← Birthday Cheer and a Year of Beer. Don’t you mean 30 Twister mats, and 78 more people? Great write up! 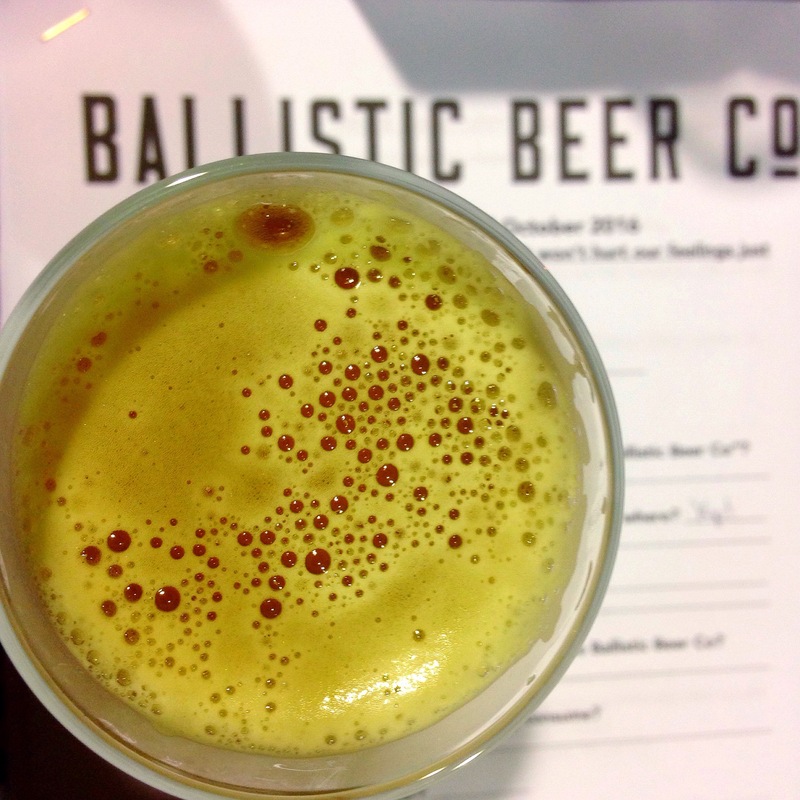 Ballistic will bring quality of beer to the southside – something they have been missing for a very long time! Can’t wait until these guys get up and running!